As the smells of summer slowly begin to turn to autumn and the lazy Scandinavian sunset turns the evening sky to fire, an office on the second floor of a big White House buzzes with life. It’s the comings and goings of a few individuals working with tireless energy, drafting the 7th chapter in what has proven to be an incredible book called YIP. Although the chapters have been written in a place nestled among the farms, forests and fjords of Southern Sweden, the book itself is impressively international, with stories coming from far reaches of the globe. From Palestine to Japan, Holland to New Zealand, Iceland to Zimbabwe and elsewhere between, it is they who fill up the pages and hold the thread. It is a type of chapter that is both written and read simultaneously, and only after each story has been embraced can it begin to take form. It requires a year’s worth of sunsets to complete, through darkness and light. And now, as the first apples fall from the trees, it’s clear the beginning is right around the corner; so let us ring in the new year and kick YIP7 off in style! As some of you might have heard, YIP7 is a go! The final touches to an awesomely diverse curriculum are underway and the houses are being prepared to welcome the new Yippies. We have 27 new participants coming from Japan, Brazil, Germany, Switzerland, Spain, Israel, South Korea, United States, Great Britain, Canada, The Netherlands, Mexico, Belgium, Norway, Sweden and Portugal, and a whole lot of experience awaiting them! Please join us in welcoming this year’s YIP7 Participant Group! Sunday, 14th of September at 2pm in the White house, Fika to follow at 3pm. 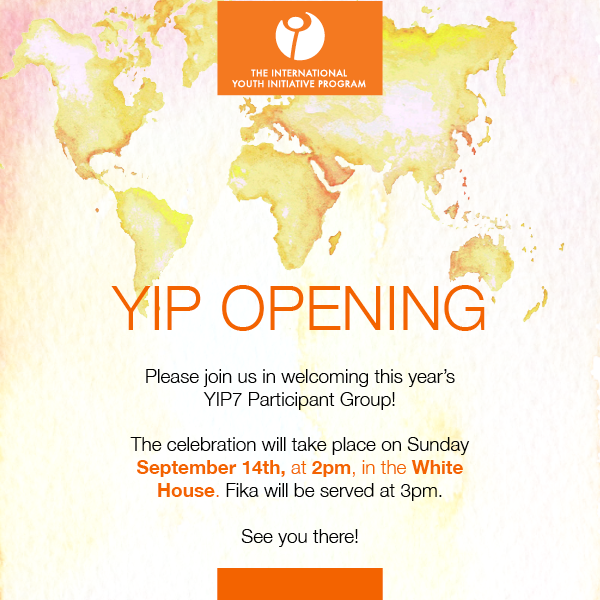 Alumni: We would like to cordially invite you to come and be part of the opening of YIP7. We are offering limited accommodation for alumni who want to volunteer from Wednesday, the 10th of September through to the following Wednesday, the 17th of September. Autumn Term: Connecting to each other, community, environment and intention. Before embarking on the journey of inner and outer discovery that YIP entails, it is important that our YIP 7 participants are able to land and truly arrive in their- to be- home for the next 10 months. This begins with locating themselves in the present and the intentions they wish to carry into the year. From there we look forward, welcoming the unique individuality of each and every participant and inviting the natural beauty and the inspiring initiatives of the area to form the ground for their YIP experience. YIP understands the necessity for an approach to education that fosters the development and health of the whole human being. In line with this imperative and in order to enable participants to digest the content offered and maintain a healthy social life, the group will together engage themselves and feel their bodies through supporting the extensive apple harvest here on campus. 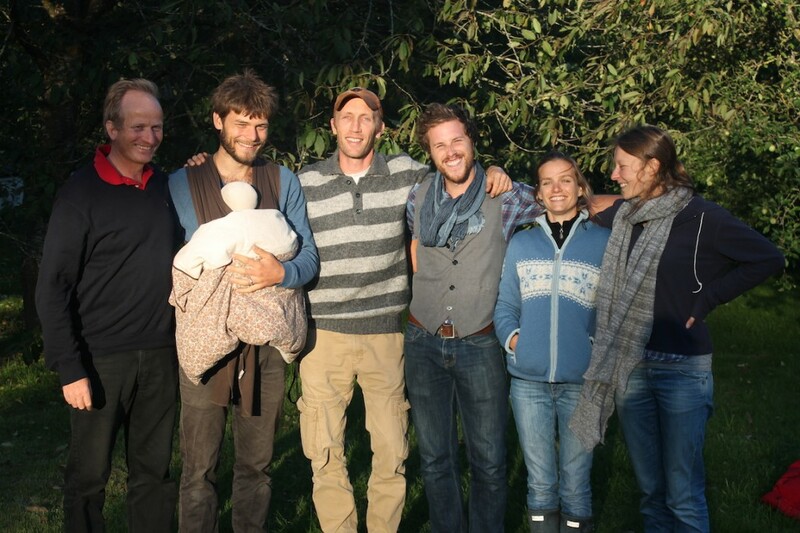 Other hands-on activities include preparing a forest garden in the Community-Supported-Agriculture initiative Under Tallarna, and turning the land of the flower crop in the biodynamic gardening training. These activities are all aimed toward getting to know one another through constructive action, building community from the soil up. Furthermore, experience has shown that the more we engage with the land in the fall, the more able we become when the receding light has us turn inward and, with purpose, face the questions that arise. Oskar Rosengren will be our first contributor of the year. A cook and coordinator of the aforementioned Community-Supported-Agriculture initiative “Under Tallarna”, in Järna, Oskar will bring the theme of Food and Nutrition and connect the dots between nature, farms and our plates. During the course week, we will work with harvesting from both field and forest, fermenting, canning and preserving. Food culture and awareness play a central role throughout YIP as a major challenge in the world, largely due to ignorance, and we are thrilled that Oskar is able to enliven our understanding, entice our taste buds, test our squeamishness and nurture a healthy sense of joy and possibility in our approach to “good” food on a personal, local and global scale. The week with Oskar will be followed by an Architect and Urbanist, Edgard Gouveia Jr., long-time contributor to YIP. Through this dynamic and energetic course, the group will have the opportunity to both, connect with each other and to meet a playfully positive approach to processes of inward and outward change. After Edgard, Kiara Nagel will introduce us to the importance of place and place making. Her workshop will build a deeper understanding of the politics and power imbalance of place we live and offer tools for understanding the places we find ourselves. What is unique about the built environment in which you are? How is the space used? Who uses the space, who does not, and why? What dreams and aspirations exist for it? The autumn term will end with a Research Challenge Week to engage and activate the group with the themes and topics following the autumn holiday. Guided by the organizing team, participants will work together to investigate and present the current global infrastructures informing economy, justice, environment, religion and society; rich ground for exchange and learning with 15 different countries represented! In this way, fertile soil will lay ready to receive the themes of global challenges tackled up to winter break. There’s a new team gathered in Ytterjärna for the 2014-2015 YIP year! Each from vastly different backgrounds and spectrums of experience, they’ve found their way here from many different parts of the globe and are all excitedly awaiting the YIP 7 participants. Picking up and being busy with YIP preparation in the last weeks in this new team constellation has been filled with situations ranging from hilarious to bizarre and always with the YIP 7 participant photos observing us from their position on the wall of our office. Now we are ready and eagerly awaiting the real thing – the arrival next week of YIP 7 participants.